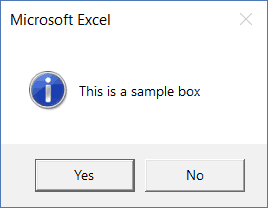 Excel VBA MsgBox [Message Box] - All You Need to Know! 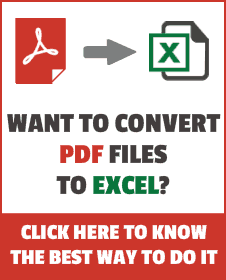 Excel VBA MsgBox [Message Box] – All You Need to Know! >> Excel VBA MsgBox [Message Box] – All You Need to Know! A MsgBox is nothing but a dialog box that you can use to inform your users by showing a custom message or get some basic inputs (such as Yes/No or OK/Cancel). 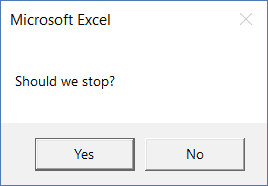 While the MsgBox dialog box is displayed, your VBA code is halted. You need to click any of the buttons in the MsgBox to run the remaining VBA code. Note: In this tutorial, I will be using the words message box and MsgBox interchangeably. 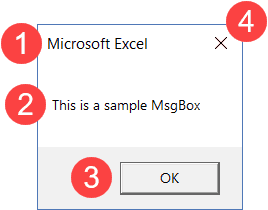 When working with Excel VBA, you always need to use MsgBox. Title: This is typically used to display what the message box is about. 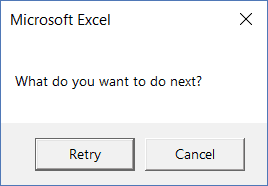 If you don’t specify anything, it displays the application name – which is Microsoft Excel in this case. Prompt: This is the message that you want to display. You can use this space to write a couple of lines or even display tables/data here. Button(s): While OK is the default button, you can customize it to show buttons such as Yes/No, Yes/No/Cancel, Retry/Ignore, etc. Close Icon: You can close the message box by clicking on the close icon. As I mentioned, MsgBox is a function and has a syntax similar to other VBA functions. prompt – This is a required argument. It displays the message that you see in the MsgBox. In our example, the text “This is a sample MsgBox” is the ‘prompt’. You can use up to 1024 characters in the prompt, and can also use it to display the values of variables. In case you want to show a prompt that has multiple lines, you can do that as well (more on this later in this tutorial). [buttons] – It determines what buttons and icons are displayed in the MsgBox. For example, if I use vbOkOnly, it will show only the OK button, and if I use vbOKCancel, it will show both the OK and Cancel buttons. I will cover different kinds of buttons later in this tutorial. [title] – Here you can specify what caption you want in the message dialog box. This is displayed in the title bar of the MsgBox. If you don’t specify anything, it will show the name of the application. [helpfile] – You can specify a help file that can be accessed when a user clicks on the Help button. The help button would appear only when you use the button code for it. If you’re using a help file, you also need to also specify the context argument. [context] – It is a numeric expression that is the Help context number assigned to the appropriate Help topic. If you’re new to the concept of Msgbox, feel free to ignore the [helpfile] and [context] arguments. I have rarely seen these being used. Note: All the arguments in square brackets are optional. Only the ‘prompt’ argument is mandatory. In this section, I will cover the different types of buttons that you can use with a VBA MsgBox. Before I show you the VBA code for it and how the MsgBox looks, here is a table that lists all the different button constants you can use. Note: While going through the examples of creating different buttons, you may wonder what’s the point of having these buttons if it doesn’t have any impact on the code. It does! Based on the selection, you can code what you want the code to do. For example, if you select OK, the code should continue, and if you click Cancel, the code should stop. This can be done by using variables and assigning the value of the Message Box to a variable. We will cover this in the later sections of this tutorial. Now let’s have a look at some examples of how the different buttons can be displayed in a MsgBox and how it looks. MsgBox "This is a sample box"
Note that the text string needs to be in double quotes. You can also use the button constant vbOKOnly, but even if you don’t specify anything, it’s taken as default. If you only want to show the OK and the Cancel button, you need to use the vbOKCancel constant. You can use the ‘vbAbortRetryIgnore’ constant to show the Abort, Retry, and the Ignore buttons. You can use the ‘vbYesNo’ constant to show the Yes and No buttons. You can use the ‘vbYesNoCancel’ constant to show the Yes, No, and Cancel buttons. You can use the ‘vbRetryCancel’ constant to show the Retry and Cancel buttons. You can use the ‘vbMsgBoxHelpButton’ constant to show the help button. You can use it with other button constants. Note that in this code, we have combined two different button constants (vbRetryCancel + vbMsgBoxHelpButton). The first part shows the Retry and Cancel buttons and the second part shows the Help button. You can use the ‘vbDefaultButton1’ constant to set the first button as default. This means that the button is already selected and if you press enter, it executes that button. Below is the code that will set the second button (the ‘No’ button) as the default. In most cases, the left-most button is the default button. You can choose other buttons using vbDefaultButton2, vbDefaultButton3, and vbDefaultButton4. Apart from the buttons, you can also customize the icons that are displayed in the MsgBox dialog box. For example, you can have a red critical icon or a blue information icon. Below is a table that lists the code that will show the corresponding icon. If you want to show a critical icon in your MsgBox, use the vbCritical constant. You can use this along with other button constants (by putting a + sign in between the codes). For example, below is a code that will show the default OK button with a critical icon. If you want to show a critical icon in your MsgBox, use the vbQuestion constant. If you want to show an exclamation icon in your MsgBox, use the vbExclamation constant. If you want to show an information icon in your MsgBox, use the vbInformation constant. When using MsgBox, you can customize the title and the prompt messages. So far, the example we have seen have used Microsoft Excel as the title. 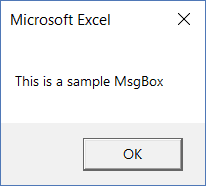 In case you don’t specify the title argument, MsgBox automatically uses the title of the application (which has been Microsoft Excel in this case). 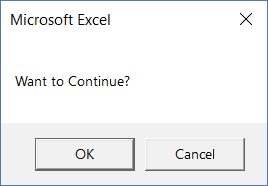 MsgBox "Do you want to continue? ", vbYesNo + vbQuestion, "Step 1 of 3"
Similarly, you can also customize the prompt message. You can also add line breaks in the prompt message. In the below code, I have added a line break using ‘vbNewLine’. 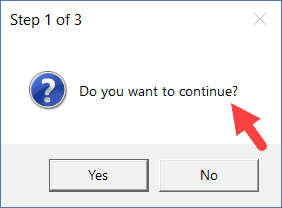 MsgBox "Do you want to continue?" & vbNewLine & "Click Yes to Continue", vbYesNo + vbQuestion, "Step 1 of 3"
You can also use the carriage return character – Chr(13) – or line feed – Chr(10) to insert a new line in the prompt message. Note that you can add a new line to the prompt message only and not the title. So far, we have seen the examples where we have created message boxes and customized the buttons, icons, title, and prompt. However, clicking a button has done nothing. With MsgBox function in Excel, you can decide what you want to do when a user clicks a specific button. And this is possible as every button has a value associated to it. So if I click on the Yes button, the MsgBox function returns a value (6 or the constant vbYes) which I can use in my code. Similarly, is the user selects the No button, it returns a different value ((7 or the constant vbNo)) that I can use in the code. Below is a table that shows the exact values and the constant returned by the MsgBox function. You don’t need to memorize these, just be aware of it and you can use the constants which are easier to use. Now let’s see how we can control the VBA macro code based on what button a user clicks. In the below code, if the user clicks Yes, it displays the message “You Clicked Yes”, and if the user clicks No, it displays, “You clicked No”. Else: MsgBox "You clicked No"
In the above code, I have assigned the value of the MsgBox function to the Result variable. 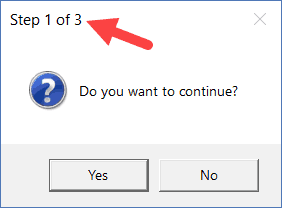 When you click Yes button, the Result variable gets the vbYes constant (or the number 6) and when you click No, the Result variable gets the vbNo constant (or the number 7). Then I used an If Then Else construct to check if the Result variable holds the value vbYes. 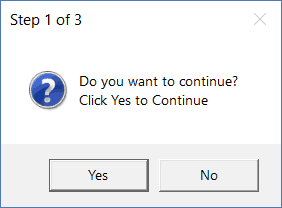 If it does, it shows the prompt “You Clicked Yes”, else it shows “You clicked No”. You can use the same concept to run a code if a user clicks Yes and exit the sub when he/she clicks No. Note: When you assign the MsgBox output to a variable, you need to put the arguments of MsgBox function in parenthesis. For example, in the line Result = MsgBox(“Do you want to continue?”, vbYesNo + vbQuestion), you can see that the arguments are within parenthesis. If you want to further dig into the Message Box function, here is the official document on it. Working with Worksheets in VBA. Working with Workbooks in VBA. How to Create and Use Personal Macro Workbook in Excel. Useful Excel Macro Code Examples. Using For Next Loop in Excel VBA. How to Run a Macro in Excel – A Complete Step-by-Step Guide. This was probably the best explanation ever. Kudos. What if the X (or as you call it the close icon) gets clicked????? What happens if you click on the Close button of the dialog box? What value is returned if any?